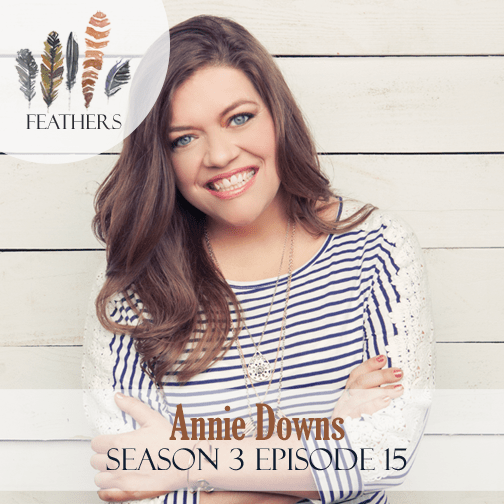 In this episode, I interview Annie Downs. Annie Downs, author of Looking For Lovely, is also a speaker and blogger based in Nashville, Tennessee. Flawed but funny, she uses her writing to highlight the everyday goodness of a real and present God. An author of three previous books – Let’s All Be Brave, Perfectly Unique, and Speak Love, Annie also loves traveling around the country speaking to young women, college students, and adults. Annie is a huge fan of bands with banjos, glitter, her community of friends, boiled peanuts, and football games. Annie shares her journey of facing a break down and wanting to quit and then learning how to look for lovely and find the things that help her perservere. You can’t run from God and he’s kind enough that he doesn’t let you. I always found a way out of the hard instead of through it. So, I didn’t have to deal with it, but I also didn’t get the benefits of it. You survive it by finding the beautiful things in the hard. I eat salad everyday. I’m not trying to get in a bikini, I just want my brain to work. I’m going to tell you my answers, but you need to find your answers. When you don’t feel your feelings they bottle up and they come out in different ways. Stopping is not the same as quitting. Here’s the message: find the things that are the knots in the rope that will help you get through and then purposely go after those.